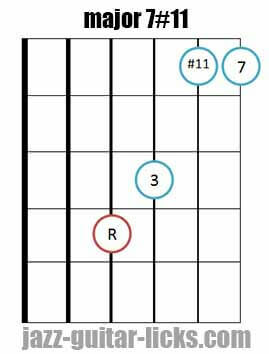 A major 7#11 chord (major seventh sharp eleventh) also called Lydian chord or Lydian augmented chord is a basic major 7th chord with a #11 (#4) added instead of the fifth (5). The #11 can be considered as the fourth (4) sharpened in the higher octave. In a chord chart notation, Lydian indicates a major family chord with an added augmented eleventh. Altering the fifth of any major 7 chord brings a little bit of tension and adds a Lydian flavour to your playing. The #11 extension is described as modern sounding, that's why it is more present in modern jazz tunes than in classic jazz standards. Therefore, it can be very interesting when you want to add spice to your chords in any harmonic context. Indeed, this chord can replace chord IV in major keys and even the chord I to add harmonic interest. Chord tones are 1,3,#4, 7. The Simpson theme song. Cmaj7#11 on the first bars. 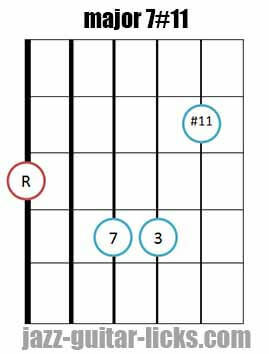 Here are four main positions to play major 7#11 chords on the guitar. The first, second and fourth diagrams are surely the most commonly used positions, they contain the four notes needed. The second is particularly because there are two thirds in it, but it is quite interesting and useful to know it. Major 7#11 guitar chord position - Bass on sixth string. Major 7#11 guitar chord position - Bass on fifth string. 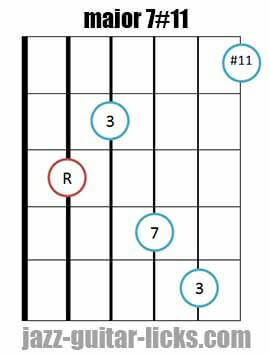 Major 7#11 guitar chord position - Bass on fifth string - Two thirds. Major 7#11 guitar chord position - Bass on fourth string.